You have captured the state of the world since Adam. Sadly, it will be so until Christ returns. Can I make public confession ? I live in a western country and work in an area with high percentage of muslims, and I can see how they take advantage of the system and how they change the culture of the city and a lot of the time I get this feeling that I want to “kill” or at least get rid of them. I know it’s sinful and demonic, I said it in my confession quite a few times. At times I am able to fight the thoughts by replacing them with a short prayer “Lord have mercy on all your creations” , but not always. Please pray for me. Thanks for this teaching and reminder, Father. Lord save us from ourselves! There are probably a thousand ways for the temptation to reach our hearts. No one is immune. The hermit in the desert is just as vulnerable as any other – our adversary lies within. In the battle in which we live – I think it is important to engage ourselves in the positive things – the building up and nurturing of the good and of beauty, etc. It is a very slow work – like planting an olive grove where the fruit will barely be seen in our lifetime. It takes patience. My own temptation is to be overly consumed with tearing down those who tear down – to smash the smashers. It’s quite insidious. That said – God give us the grace to “sow to the Spirit” (as St. Paul says). The work to be done is inside ourselves. Just to expand a bit on Paul’s comment, it was the state of Adam’s heart, lead into temptation, forsaking his communion with God, that brought about the state of the world. Hence, Solzhenitsyn’s quote “the line separating good and evil passes…through every human heart, and through all human hearts.” And we are called to a life of repentance in a world where the evil forces will continue to “smash” the image of God. Father, I all too well understand how blind and insensitive the human heart can be. You gave the example of the Nazi regime: “people can only wonder how anyone ever took seriously its grand productions…”. I wonder too, at the many times I have fell for lies…lies I have told myself, or the lies of others. Weak and gullible, ripe for the exploitation of demonic powers. I don’t know…I can not explain it in just a few words…even a book with sequels would fall far short, but there was a time when I realized this gift from God you talk about, His love, was there all along. I have a strong sense of the warfare, because in retrospect I saw how it had liked to kill me. And the more I realize His wondrous plan of salvation through the God-Man Jesus Christ, the more I realize my unworthyness and the power of His love. Thank you so much for speaking on this topic. We need to know these things, to walk circumspect, like St. Paul says, with faith and trust in God. Recently we had another priest come to our parish and give a retreat. This priest is very different than our current priest, and his emphases is different. One could say crudely but accurately he is the “opposite” of our priest in style and substance. This in of itself is neither “good” nor “bad”, rather just different. I myself enjoyed the change and got several things out of it. I was taken aback by the reaction of so many in our parish. The reaction was swift and definitive and non-negotiable – what this man said/did was wrong and even evil. When asked to explain they could not, it was like they had lost themselves. I myself engaged in a couple of futile efforts to “smash the smashers” and to bring something out of their (very emotional usually, cold and calculating in some instances) reactions that I could make sense of. After ruminating on this event for a few days it hit me: I had seen the demonic in action in a very clear way. People who I know to be normally reasonable, reliable judges of character, etc. had become almost unrecognizable. Not everybody was “possessed”, and it was seemingly random as to who was and was not. What was clear was that any building up (in a communal sense) that might have been the result of the visit was thwarted. I have questions. Did these demons travel with this person, or were they already present amongst us (I am leaning to the latter)? Why were some “possesed” who I would not have expected to be so, and why were others who I would have expected to be, not? What am I to do with all this? Your comment was interesting and worth posting. However, comments which use false or hidden email addresses (only seen by me on the dashboard), are not cleared for posting. It’s a very minimal accountability – but important. If you care to share your comment with a proper email address, I would be glad to post it. Thank you for this, Father. Even this morning I found myself drawn towards non-existence in a very palpable manner. I could not make sense of it until I read this. Glory to God, who uses even our sin for our enlightenment and salvation. God grant me repentance. Pray. May God preserve you! I’ve been battling lots of dark thoughts of late (not unusual). The battle truly is in every human heart – acquiring the Spirit of peace (as Esmee noted) is a primary need. Jesus Son of the Living God, Have Mercy On Me; A Sinner. Father, really good article. I first ran into the destroy to live their in Nietzsche’s Thus Spake Zarathustra, On the Three Metamorphosis of the Spirit. On one level it can seem quite attractive even spiritual in it’s mimicry of the purification, illumination and theosis model within Orthodoxy. So destruction (smashing the smashers) can seem virtuous. Still, what are we to make of the idol smashing the Apostles did as reported in the Bible and other sources? I’m not sure I recall the Apostles’ smashing idols in the Scripture. There are plenty of such accounts in early centuries – a sort of clash of civilizations. I think it is an action to be noted, but not to be copied – I do not think it is virtuous in and of itself. It is zealotry and you can make of it what you will. I am not so sure I would have agreed with Solzhenitsyn, when I was an Evangelical, about the line separating good and evil running through every human heart. It seems that forgiveness and repentance were easier then. I believe much of this comes from Orthodox prayers. When prayed they eventually seep into your very being as does praying David’s great Psalm of repentance, 50 (51). Hard to deny sin when one confronts its reality every day. Father I am sure your are right- Apostolic haigioraphy. Still the reason given for the idol smashing was frequently because they were essentially demonic icons. More to the point is my own tendancy to be a “strongly opinionated voice” in meetings not with the emotional blackmail of the couple in Fr. Weber’s piece you linked to but stated stongly nonetheless. I do it most of the time wanting folks to respond in kind with their own strength in hopes that a solution can be reached. In fact my wife and I do that. In meetings however I can end up dominating by default. My solution has been to avoid the meetings altogether. If I am in one, I try to just be outwardly silent. Most folks do not really care in any case. Especially being a recovering rage-aholic. Real dialogue is difficult to achieve but when it happens it is magnificent. Thankyou for suggesting “The Sunflower” a few of Father’s posts back. It’s been one of those reads that I will return to over and over again. Just what I needed at this point in my life. Thank you. I am grateful for this seasonally appropriate article- winter can be gloomy and dark. But the Grinch who personifies the dark of winter is a confused, broken being who never wins, so to speak, so I had the simple thought that we can fight the passions with holiday cheer and social warmth. Advent is a holy season, and we do enjoy it, but it is also fraught with stress as we struggle with duties within and beyond Orthodoxy per se, such as finding and affording appropriate presents for loved ones or participating in parties and being spiritually “present” (as in nepsis and politesse). The people saying “I hate the holidays” are everyday demoniacs who deserve our patience – I pray for a dear family friend who is struggling to appreciate Christmas mostly because she is lonely and hungry (I did what I could to help today, but that’s just a start). It’s not that demoniacs seek sin due to inherent evil, but that they fall through the cracks of human dignity and wellbeing, which is our collective responsibility. Scrooge did not become Scrooge all by himself. And on the other hand, St. Nicholas was not effortlessly generous – he learned the meaning and justice of almsgiving and agape the same way we do. I identify as a former demoniac, but we are all exorcised in Holy Baptism, so this does not make me special; rather I see it as natural in the Orthodox path of theosis and simultaneous recovery process. The hagiographies of saints typically describe some demonic problems saints have throughout their lives, so we struggle too, especially when we do not ask for help. I have no special insight into this problem, beyond recognizing the need to check in on those we love, and be compassionately open-minded in listening the way we would like to be listened to. So, the basic solution to our spiritual battle is very simple, as in the title of a digital CD from the St. Elizabeth Convent in Minsk, Belarus – You Simply Have to Love. I mention this product not only because it is wonderful and affordable (while I am only a customer and lover of this Convent), but to tell a very short story – when I listened to this CD this autumn one morning, as recreation and inspiration for prayer, I wept profusely, the most I ever have as an adult man, in recognizing the dolorous and hidden betrayal of our First Love, Jesus, and apostasy from His Body in my youthful generation (and my own role in this unfaith as I had procrastinated entering the Church due to fear and shame). How does Jesus feel, in His innocence and meekness, when His former altar servers and other young people stop attending church? I don’t know, but it’s difficult to imagine God’s feelings about this. I also wept in response to the tragedy of how familial divorce has traumatized my friends and affected their understanding of marriage and intimacy. In a sense, (not to trigger concern about the humiliation of American colleges’ social doctrine with these words), I wish I could check my intact family privilege. It is so hard to find, meet, and love Jesus in a world that can seem to be only consisting of temptations, injuries, and excuses, and I give thanks to Fr. Stephen for explicitly telling us in his fascinating book that tears are essential to Christianity (my paraphrase, as I don’t remember your exact phrasing). From contrition to compassion to joy, the human heart has a lot to say through weeping. I have a firm belief that tears are an underappreciated resource in peace-keeping and spiritual health because of macho stigma against men having “sensitive” emotions (and this same Stoic phobia oppresses women too, I know that it is basically universal, but the social consequences of a man publicly crying are uniquely challenging). It would be much easier for angry people to remain nonviolent if they were allowed to cry, but any intoxicated society is allergic to sorrow. Compassion is forbidden by the philosophy (or ideology?) of death. God is hidden from those we worry about because they do not receive or recognize the compassion they need to know they are loved. Frankly, I notice a lot of depression which I suspect has to do with sunlight deprivation and subsequent Vitamin D deficiency. Demons are known to try to starve people, mostly through gluttony, isolation, and poverty. In prior years, I took the Nativity fast way too far, while moderation is essential to success in fasting. All of this is relevant in that I hope and believe that part of how we can cooperate with our Lord Jesus Christ to resist demons is through healthy behavior. Another health matter in fighting demons is distinguishing between possession and mental illness – the stigma around sin confused the two. I pray for my psychologist, a faithful Christian, but I have little idea how stressful his job is, as counselors take on some responsibility for their clients’ wellness. It was only this year that I finally trusted him (and of course my spiritual father too, especially in intense confession that I consider exorcistic) with my deepest problems, and his funny, sweet guidance has transformed me. I am remembering that apostolic grace partly explains the human power to help others. Finally, while the opposite of demonic is angelic, Fr. Stephen explained in his book that symbolic is opposite of diabolic. So holy symbolism and the ecclesial unity we crave involve communion with Christ’s bodiless spirits. We venerate all of the named archangels, but few non-Orthodox Christians can name more than three of them. This reveals grave ignorance of the archangels beyond their Prince, Michael. How typically elitist it is to forget the less-famous archangels, yet we seem like modern Pharisees to others. Anyway, I really like how the archangels each have their own beautiful, helpful roles. The best antidote for me is to learn the discipline of giving thanks which builds to a growing trust in the overwhelming Providence of God through our Lord and Savior. Father, I really ought to start disciplining myself to read your blog entries more often because you are so focused, on topic and target every time! Having said that, I am unclear about something you wrote in terms of our course of action. At the risk of asking a tongue-tying question: How does one, as an Orthodox Christian, smash the smashers—more precisely, their ideologies and destructive agendas—without the risk of blind zealotry, or running on fumes of nostalgia and feeding one’s ego? To clarify, how does one cultivate an authentic esteem for all “human beings, images of God”, while fighting the “good fight” against destructiveness and brutality? As you rightly pointed out, the smashers are really only “pawns” of the Evil One and his minions (the demons), and our role is to be motivated by love for the other, for “God is love…love is the only true existence—all else is distraction and distortion, a movement towards non-being”. It’s that very distraction and distortion tactic of our Adversary that can be used on both sides. For instance, the online world of Orthodoxy has become important to many in terms of information and a sense of community. Yet, there’s this label online of “Uber Orthodox”: those in chat groups or blogs, who know all the ins and outs of Church History, the writings of the Fathers, each iota of the Ecumenical Councils, yet there’s a spirit of demeaning and hunting down not only anti-Christian agendas, but the souls behind the, and perhaps worse, fellow Orthodox who don’t tow their line, as if an Inquisition is taking place, There seems also to be a component of nostalgia I alluded to above: ie, the days of Holy Russia, the glory of Byzantium, where Orthodoxy becomes and ego-booster for those wishing life was more Tolkien or Star Wars-like (good against evil). Without Christ at the center of all that motivates us our Adversary must smirk when all sides have become smashers of the other. Personally, I stopped participating in the chat groups because I finally excavated my own motivation for putting my two cents in—pure ego! Many clergy blogs are a terrific in analyzing the world’s systems. Some even go farther with a prognosis of what lies ahead if nothing is done, yet few seem to prescribe inner change while being in the world (your last paragraph starts to do this, as do the lives of the Saints). We can’t expect everyone in the clergy who has a blog to be spiritual adviser to every reader, yet as Christians we all have commonalities in the stages of our given walk, and well all live in the world. Yes, we have Scripture, Tradition, the writings of the Holy Fathers, and, hopefully, each has a spiritual adviser. Very little online addresses a course of action regarding corrosive agendas in the world; most seem to skip over the part of what we can be doing writ large as a community. The Benedictine Option spun around for a while, and had it’s appeal, but we are called by our Lord to be “salt” and “light”: salt preserves (the Good, the Truth, the Beautiful, etc) and light guides. In a nutshell, how to “be in the world but not of it” while while bearing the Good News to it, and truly loving those we encounter? (Thank you Father, I apologize for being so lengthy). I think there is always a danger in saying “just love”. Today a quote from John Lennon popped up on my FB feed: “It matters not who you love, where you love, why you love, when you love or how you love, it matters only that you love.” It is the usual, generic nonsense of the world; often used to justify anything and everything. We must love with God’s love and love God first and foremost. The love of power, of gluttony, of possessions, of improper relations with others, of idols of all kinds is demonic. Love is the greatest of virtues and it suffers the greatest abuse of all the virtues. Indeed, like the virtues themselves, love can be distorted into a passion in our lives if our focus is not on God. It is not simply love we must practice, but love of God; because it is only through God’s Love that we may truly love the world and be at peace with all in it. Just my thoughts as I continue to pray and ponder this. Thanks be to God for the healing He has given me already. Thank you once more Father Stephen for a helpful post. I too recognise my own tendency to focus on those who break things apart, and then obsevre to my shame what occurs within my own heart . . . Briefly another aspect which comes to mind is DC Schindler’s recent book ‘Freedom from Reality – The diabolical nature of modern freedom’. Schindler uses the transliterated sense of diabolical – lit. to throw asunder, or split apart. I couldn’t help but think of this when reading your description of the demons. I am sadly aware of those of whom you speak. With tears, I have to say that they do not know God. I pray that they will come to know Him. But the darkness that can be found in these places, filled with judgment, and puffed up with “knowledge,” are not places where Christ can be found. They are a blot on the Orthodox faith. This is tragic. Worse still, I’ve encountered some who boast of their connections to this monastic or that elder and such, as though the holiness of their confessor somehow empowers them to speak badly to others. They need lots of prayer – and should be avoided. I do not allow them to comment on the blog. I do not think we have a commandment from God to “smash the smashers.” If we trust in the Providence of God, we will understand that those who are the enemies of the faith, or who seek to destroy His creation (in ever so many ways), are in His hands and will be brought to whatever end God has for them. We need, especially in these darkening days, to grow ever brighter in our joy and our confidence in the light of God and in the goodwill of His Providence, working in all things for the salvation of all. This is our faith – and it is our faith that is victorious. We will win – we will reign with Christ – but we are promised that we will suffer in this world and that we will endure dark days. Nations come and go. Cultures rise and fall. God has written His word into ever particle and sub-particle of creation. Thus, every atom of the universe agrees with Him and gives Him glory. Evil is very, very weak. It must be weak – considering how long it has been at work – and yet goodness abides in so many ways and so many places. Every child entering the world does not enter as an evil child, but is enlightened by Christ. It is for us to rejoice in the mystery of God’s goodness, and to live it as fully as possible. I often think of the paradox of how God works. He “causelessly causes.” In the same manner, we should “smashlessly smash.” Our refusal to smash the smashers it what will ultimately smash them. O, strange wonder! Dimtri part of what you describe is what I call the scapegoat syndrome. It is fundamentally iconoclastic. It seeks a purification of a “community” by placing the blame for all of the dysfunction on one or more of the other people instead of one’s own heart. If the “others” are driven out then a period of peace often descends on the community for a time until the next “issue” raises it’s head and a new scapegoat is found. It is extrodinarily destructive and quite difficult to heal. All communities are subject to the temptation. The community I was in prior to becoming Orthodox was infected with it so I participated in it. The syndrome is actually quite complex but you can see it in operation in our current politics in the US and unfortunately in some situations in the Church. Healing it takes deep repentance/forgiveness and a steadfast refusal to blame anyone for anything “bad” except oneself while at the same time time learning to trust the Providence of God and giving thanks. It is not easy. It can seem that the “bad guy” is getting away with stuff. At the same time real problems must be addressed. Why did God breach the peace of non-being? In a way, it seems fitting to want to undo oneself the more one ponders his own sin. A man is dragged into being and can’t undo a single pain inflicted on another. For God to impute a hollow goodness is just a costume fitted on a rude animal, and to sanctify a man is to gift him a sharp awareness of his own vice. How can a truly good man not beg God to strip him with his sins from the cosmos? May the God who spoke a trillion suns into existence unspeak my offenses and their author, me. I think your question is profound. God does not “impute” a hollow goodness. At least that is not how classical Orthodox Christianity would understand it. God created us good and will return us to that good. There is indeed a struggle at present – but, at least to paraphrase St. Paul, the present sufferings are not worth comparing to what is being brought forth. What is your theological tradition? Forgive me, but some of it sounds like Reformed thought. Though I am aware of sin – I primarily see it as something sorrowful – a brokenness – not particularly as “offense.” But, even now, the beauty of creation, and even the beauty within the human heart crushes the darkness that I see as well. If the “sanctification” of man gifts him with a sharp awareness of his own vice – and that awareness seems to be overwhelming as you describe it – that is not sanctification. It’s more like neurosis. Our sin is not the primary focus of a sanctified mind – rather, it is the love and goodness of God. Forgive me. It’s so refreshing that you always return to the love of God for us…for God so loved the world….Someone commented that a guest priest was very different than his own priest, in presentation, message, etc. We have had 3 priests over the years. Each is so unique with his own gifts, foibles, etc. One focused on social justice, another on living a simple life, and the other on Christ’s love and goodness to us…not that they all didn’t preach His grace. Yet, the one who preached His love and tender mercies toward us, toward me, spoke to this heart so much more. I do not think I am unique. I love speaking to Christ of His tender mercy, His steadfast love, His loving-kindness toward us. I so need the wind of the Spirit beneath my sails, to be lifted up, to be healed and set in liberty each day. Scott, as a sinful man myself I can understand your sentiment but I can also testify to the reordering that takes place by God’s grace if one repents in thanksgiving. It is unfathomable but nonetheless real. The healing is so deep that it takes awhile to work it’s way out and be manifest entirely but it is there. May His mercy and love heal us all. Thanks Father. Of late it has become taxing to remark on nihilism of friends (and relations) that I have noticed. It takes varied firms, but it is a kind of temptation, and a blindness to the possibilities of the goid. At some point I wonder what boundaries I need to this for myself, and it leaves me sad with a sense of loss. There seems to be nothing I can do about this except to increase my time in prayer. Thank you Father Stephen for this post that keeps us on the embers, which keeps us on the thread of our spiritual reality …. Thank you also for the very good comments, which feed the thoughts and the conscience. Just a reflection I heard from a priest, who challenged me and may echo, in a certain aspect, about you …. “We know very well where we are going … the specter of the rarefaction of faith, of which the Gospel speaks, of the widespread apostasy, the specter that would show us a very small number of Christians remaining on the earth and holding up at the end, as Christ says, because the one who will hold to the end will be saved … But also the Holy Spirit “challenges” us in the presence of Christ, challenges us, what do we do with what we are bequeathed, with this gift of faith, and above all, what are we going to do with the presence of Christ in this world ! and one of the great satanic illusions is to make Christians believe that they are in a world from which God is absent. The time of Judgment is at work ; demons can be unleashed outside and in ourselves. Let’s stay closer to Christ, in His breath, to deliver us from our own demonic specters …. It’s hard to escape a Reformed mindset. The Reformed picture of the cosmos is a ruin, a ship on fire with too few lifeboats. I think my Dutch forefathers would’ve looked at time’s arrow pointing toward healing instead of an exacting justice and say, “Too good to be true.” They seek to escape the agony dealt by the Father’s hands. They wave an acquittal signed with the Son’s blood and pray they aren’t doomed as “vessels of destruction”, the larger mass of mankind fed as lumps of coal into God’s glory mill. But just because the Reformed catastrophize all of being doesn’t prove they’re wrong. When I feel low, I suspect Reformed dysangelism is true. A religion dreamt by those who faced a cold, gray sea and believed their former gods would fail. It is hard to escape. My own experience was that the tools of Reformed thought had shaped me as a user of them, and they had to be set aside, and only very carefully considered as an Orthodox (thinking particularly of the whole textual critical apparatus). Rather than reference everything against my own comprehension, I am having to learn to reference all to Christ. To see the world in a grain of sand and heaven in a wild flower, as William Blake put it. The relationship of all things in Christ means somehow that He would be diminished by my or your nonexistence, and not in the Reformed sense where God gets glory in the wretchedness of eternally punished sinners. Our suffering somehow fills up the measure of the suffering of Christ – or so Paul says. We get to be faithful. I think that is a beautiful description of the Church, “the faithful”. Wait for the Lord, be strong and let your heart take courage; wait for the Lord. And I say this knowing I am an impatient American! Lord, have mercy! Oops! My comment should have been directed to Mark M., not Scott. You are not alone here. There are many participating in this blog who struggle as you have well expressed. However, I would like to encourage your continued participation here, addressing your questions to Fr Stephen and/or the rest of us as you are. Fr Stephen has helped so many in his discussions with those who have lived and believed under other theological thought. From what I have learned from my readings here, such struggles are very difficult. In my own upbringing I have not had such instruction and didn’t come into Christianity (into Orthodox Christianity) until late in my life. That has spared me some difficulty, but I’m not without darkness, I have passions. We all struggle. I would like to offer encouragement which I hope is in keeping in the Orthodox Way (I’m still young in the faith and need guidance myself) and hope what I write below will be helpful for your consideration. The cosmos is not in ruin. This is not the ‘fallen world’ but the world of the fall. It may seem that I’m wearing ‘rose-colored glasses’, but I attempt to point to an important distinction. I am not as eloquent as others here, but I affirm, not just with my heart but with a mind immersed in the ‘nuts and bolts’ of this world, that it is not what has been ascribed to it by a culture immersed in another theology. Even before becoming a Christian, these beautiful and ‘untainted’ “fields” in the very fabric of this world can be ‘seen’ and provoke wonder not despair. These fields speak of another reality, and as Fr Stephen writes, point to Christ. May God give you peace in your journey! I smile came to my face as my mind was wandering, pondering your Dutch ancestors. It wandered to those other intrepid sailors, the Greeks, who included so many of the early fathers of the Church. St. Gregory the Theologian was shipwrecked and survived – prompting him to give up his youthful ways and get Baptized. The Greeks who gave us Plato and such like, are a happy people, ever so less prosperous than the Northern Europeans who come to their sunny shores to vacation – yet never able to enjoy themselves in any measure that compares with the poorest shopkeeper in that land. Plato was one who stared at the Universe and was convinced of Goodness, Truth and Beauty. Indeed, he saw past the stories of the gods and contemplated the “One,” whose name he clearly did not know. His face is often to be found painted on the exterior of some Orthodox Churches, together with other Greek philosophers – seen as “prophets” of God who were somehow waiting to be proven right about ever so much. I have not given much thought to other possible cultural traits that provided the seed bed for the dark God of the Reform movement. He’s very much at home in Scotland where He has driven nearly the entire land out of the churches. Atheism makes sense in such contexts as a means to escape his angry gaze. The story of Christ is in no way the story of an angry God killing His son to appease His wrath. That is such nonsense! Every Orthodox service concludes (in the dismissal blessing), “For His is a good God and loves mankind!” The goodness of God radiates from everything around us. I wonder what those old Dutchmen would make of an Orthodox parish on the night of Pascha. The feasting and the laughter and sheer joy of the celebration puts every unbeliever reveler in a town to shame. The dark god of the Reform (or the very distorted version that haunts some minds) needs to be exorcized. That is a slow thing. Learning joy and trusting it is a slow thing. Seeing the goodness of God in every place and everything takes time as well. It is a journey well worth taking. One of my favorite films is a bit naughty (at times). Zorba the Greek, based on the book by Katzanzakis has a very unhappy Englishman, who is too timid and reluctant to have any joy, is partnered with Zorba, the passionate Greek who seizes every possible moment, even the sorrowful ones and dances. It’s “naughty” (Zorba says that the only unforgivable sin is if a woman calls a man to her bed and he refuses to go). But it’s still very Greek – and that part is suffused with a joy for life taunts the awkward Englishman until he learns to dance. And he doesn’t ask how to dance until all of his plans and intentions have ended in failure – a complete catastrophe! Zorba treats the failure with dance and laughter saying that he now “loves” him. Katzanzakis reminds me of Tolstoy. Neither is an “Orthodox” writer, but both come from cultures so permeated with Orthodoxy that it can still be discerned in their work despite their apostasies. Several years ago, I convinced the Romanians and Moldovans in my parish to teach us to dance – poor Anglo’s like myself need it so much. I can say without reservation that I’ve never been so happy in my life until I learned to be happy in an Orthodox manner – and my awkward Anglo ways are still challenged all the time. Thank you for reminding me of the profound insights of Dostoevsky and Solzhenitsyn; but, most of all, for demonstrating how absolutely vitally relevant the teachings and practices of the Neptic-Hesychast tradition within Orthodox Christianity is for today. The real heroes of history, it turns out, weren’t wielding swords or expanding great empires; they were hidden away in a cave, praying for the salvation of all human souls, and waging war on the demons within! I am thinking aloud here…. The title of your post “The Demons of Our Time – Within Us”, if left at that, could imply that the source of demonic activity is really our inner corruption. But that is not what you describe. You say there are demonic forces that cause disintegration, non-being, within us, and true being is found in relationship with God, people and things. So demons are entities apart from ourselves. (Please pardon. I realize I am stating the obvious…as told in our tradition.) Their attempt to destroy is through power of suggestion…impressions that distort truth, reality. Nevertheless, we are held accountable for our actions because God created us with a mind capable of reason, with the ability to make choices and a heart (nous) with passions driven uphold life. Plus He gave us “kings and princes” to enforce civil law and administer penalties. We reap what we sow. This is my shorthand version. Am I off-base, Father? I ask because in the past you mentioned several times that when Christians speak of demons, or demonic activity, we do not speak rightfully…that we have misconceptions. I very much would like to know what you mean by that. Also, I deeply appreciate how you preface and magnify the goodness of God…in all your writings…but especially here when speaking about the subject of evil. I do not think it is healthy to have an inordinate focus on the works of the devil and the dark powers. But yet, I think many of us have lingering questions and need clarity (I know I do), as evidenced in your past comment about our misconceptions. Thanks for this piece! Can you recommend any books or resources that explore theology of demonic forces from this spiritual/existential perspective? “To live is to dance, to dance is to live”. Snoopy. I’m drawing from things across a range of sources – particularly in the Cappadocian Fathers. But the theme is already there in Athanasius. See this article of mine. Another suggestion is to look in the righthand column on the blog, at the bottom, there is a search box. Type in non-being and search. It will give a lot of articles. Scripture says that the evil one was a “murderer from the beginning,” and “the father of lies.” Both of those things are about non-being. But God is the author of being and He does not take it away from us (or even from the demons). In the Cappadocians, Goodness and Being are equated (along with Truth and Beauty). Non-being is not a category – it’s a direction – a movement away from the gift that God gives and towards non-being. That is the very definition of sin – a movement towards non-being. It is a rejection of what God has given. This is also a strong theme in St. Maximus the Confessor. To an extent, this understanding is so common within that part of the Patristic tradition: Athanasius, Cappadocians, Dionysius the Areopagite, St. Maximus, that it is never just singled out – it runs throughout their writings and is part of their fundamental grammar for understanding God and creation, sin and salvation. You could also do a search on “ontological” on the blog. Fr. Stephen, thank you for that summary, in your comment to Dan, of Patristic writings on this subject. It’s really helpful. Especially the idea of “direction” makes sense both ways: in the Revelation Christ is the One who is “always coming” — the whole notion of the Greek word “telos” gives us this understanding: that perfection is what is being fulfilled, what we are moving toward in fullness (and may be moving toward us!). Please pray for my family and I, everyone. I have a family member who is battling many demons right now, and I have been growing weary, cynical, and contemptuous in my attitude towards him. I have little peace, and it’s difficult to pray. May God give you grace together with all of your family. Will be offering prayers. All is in prayer…..God bless! Father Stephen; another metaphor for sin as non-being comes from Tolkien’s Silmarilion. He retells the precosmic fall of the angels as a cacophonous dissonance brought about by the prideful egotism of Melkor, who refuses to sing in harmony with the other sons of. Illuvatar. And what is God’s response to Melkor’s disharmony? He will bring about a harmonious theme greater than the original which incorporates all of Melkor’s dissonant parts. The true answer to sin and suffering must be eschatological., where God makes all things new. Discovering your writings has been a blessing. Recently, however, I read Father Seraphim Rose’s ‘Orthodoxy and the Religion of the Future’. In the epilogue to my edition, it mentions an error of spiritual deception of “trying to sanctify the world” or ” transforming the modern world into the Kingdom of God in preparation for His return”. 1) I know you’ve mentioned Fr. Seraphim Rose in a few posts, but are you familiar with this book? If so, do you think this mentioned “error” is an attack on the one story universe? (although the book predates your writings). 2) Do you have advice on spiritual discernment while living in a one story universe? I would say the opposite – that is, I agree with him. The One-Storey universe is a description of the in-breaking of the Kingdom of God in this world – that, if you will, this world is a sacrament of the Kingdom of God – when rightly discerned. What Fr. Seraphim is describing is the modern project – the exchange of a secular model of progress for the entire notion of the Kingdom of God. We can never build the Kingdom or make it be any more here than it is. The Kingdom belongs to God and is not a human project. Christ has brought it into the world and it is already at work among us – but it is not our work. I would suggest the small list at the end of my book as a possible start on discerning in this present time. Also, Fr. T. Hopko’s 55 maxims (google it). 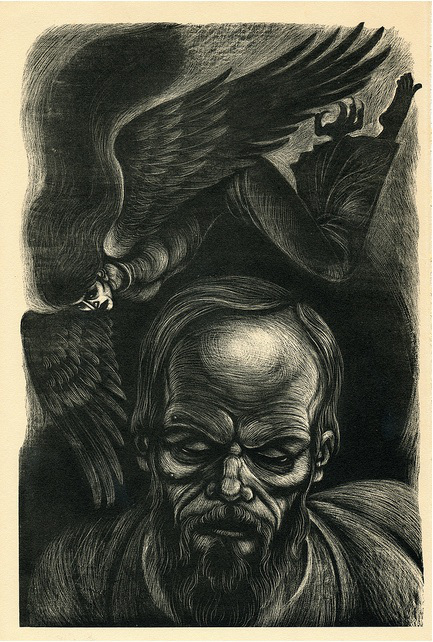 Thank you, Father Stephen, for positioning a reflection on Dostoievski’s novel “The Demons” in the increasing darkness of this month, very much appreciated! For those who have not read this work, (and for me also, who needs to reread it in light of our present worldly calamaties) may I add that even in such a dark work, the light of redemption is present. I don’t want to give the elements of that theme away, but surely the real protagonist of the work is not antihero Stavrogin, but the rather Quixotic Stepan Trofimovich, even though through most of the novel he is presented as lovably ineffectual. It is his insights at the end of his life that to me are the saving grace of the book, exhibiting Dostoievski’s understanding of living Scripture in our lives. These demons are not frighteningly powerful, though they assuredly pretend to be. In Christ, they are conquerable. And it is really beautiful how that is accomplished in the novel. Thank you, as always, Father. I will be reading The Demons soon, I hope. I need to finish The Idiot first! John H, I also thought of the Silmarillion! As an Orthodox I do believe in demons….but I feel we must always remember with humility that the institution of our church is not infallible, & that the so called “smashers” are not without their kernel of truth. For example, the Russian church too closely aligned itself with Tsarism, and was inclined to turn a blind eye to the excesses of that semi feudalistic monarchy, its brutality, its resistance to necessary change, its insensitivity to the suffering of the poor, and lack of fairness. Extremist ideologies took root in the misery that existed, and that had been ignored for too long. Reform did come but was too little and too late. Several thoughts. There is no doubt that there were many “old demons” cranking around the Russian empire that brought on all kinds of troubles. Honest Russian history (rather than some sort of Romanticism) always acknowledges this. As I’ve noted, though, smashing is easy…it’s building that is very hard, tedious, and slow. But the story is more complex than you are allowing. Not only was reform taking place, but there was a concerted effort (certainly by many of the most radical elements) to derail reform, lest its success prevent a revolution. History is always a very complex thing. 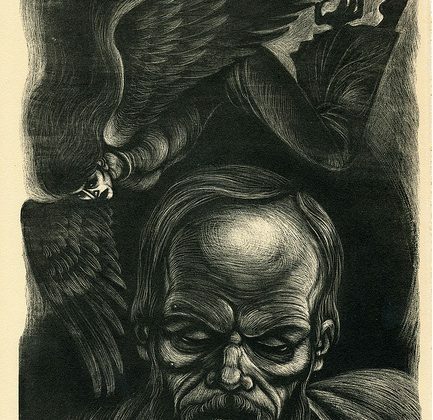 Dostoevsky’s Demons (which, by the way, has nothing particularly to do with actual demons, nor does the article) is a profound spiritual analysis, in story form, of what was taking place, quite some years before the Revolution. I think he would have said that only a true re-Christianization of Russia could have solved what was taking place – something that would have rightly addressed the needs of justice, etc. In our present world, many of the same “demons” are very active in our midst, some of them are as avaricious as anything that has ever stalked the planet, while others are as given to smashing as the most extreme ISIS radical. There is no spiritual renewal taking place that would address either problem. We are but a generation or so away from a very serious collapse, whose form and shape is known to God alone. Father, years ago I had the opportunity to tour the Exhibit “The Treasures of the Czars”. It was a retrospective if the entire Romanov Dynasty presented via actual artifacts from each time period. I walked away deeply sad because it was obvious that there was a concerted effort within Russia to recapture the Orthodox spirit in repentance. Russia is indeed a complex story with many layers and streams. There are some that reduce it to “Holy Russia” and do an injustice to the truth – very sad, particularly if it’s being done by a non-Russian for a sort of ideological thing. The true Orthodox story is also quite complex, and, as I’ve noted in a number of articles, marked by incompetence and plenty of failures. I do not feel that we should ever be defensive about this – for who we are is not justified by our excellence. Rather, who we are daily judges our incompetence and failure. Orthodoxy is, indeed, the One, Holy, Catholic and Apostolic Church founded by Christ. But, that being said, our history also brings plenty of shame to that reality. Alongside this, are the saints, the martyrs and the untold generations of the quiet faithful who will be revealed as the shining lights of the world when all things are made manifest. I am an unapologetic Russophile (and an Anglophile) for a variety of reasons – primarily because there are many things that have been made known to me in that context for which I will be forever grateful. But sobriety (nepsis) requires that we always assess things as they are. I may do an article later on this – it deserves a larger treatment. The “will” in its most fundamental form describes the “natural will.” In St. Maximus, the natural will always (!) desires what is right and good, what is appropriate for us as human beings. It is the fractured “gnomic will,” however that we have come to describe as the “will” in common speech. It is fractured in precisely the sense that it does not always choose (gnome) in accordance with the natural will – it often acts contrary to nature. Christian ascesis (repentance, fasting, etc.) has within its goal the healing of the will, the restoration of true integrity within the soul. Without such integrity, the “will” (gnomic) is generally little more than an expression of the passions to which it is enthralled. What we have seen in the Nietzschean assertion of the “will” in our modern period is a very good example of the reign of the passions. It would be more apt to say “period of the passions” than “modern period.” It is human beings as consumers (perhaps better said as “devourers”) that describe us best. On the other hand, were the will actually to be healed, what would be seen would be truly magnificent – the glory of God.